You can put the rarest / best records known to all of mankind out in the bins at a record store but it won't matter because severe record junkies think all the good stuff isn't what is readily available to them. In their mind the "good stuff" is hidden just slightly out of their reach... behind the counter, in back rooms, and in the pile tucked in the back of the store that says "not for sale". I don't know what it is about this personality type but every day, seriously, every day, someone shopping at the store asks if they can go through the records that are not meant to be looked through. 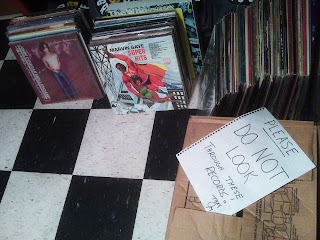 It's as if they think there is a conspiracy against them and the store is purposely hiding the records they really want in places other than where they are intended to shop. "Where are you guys are keeping the good stuff?" I dread that question and I can promise you that anyone else who works at record shop does too. There is no mystery collection waiting for you like the promised land. Smaller shops don't have a plethora of space to work in so sometimes the kind of stuff that might be hidden from the public eye, IE a new used collection that has yet to be priced or a new release delivery is placed in semi - plain sight because we have nowhere else to do this work but apparently for some people, the temptation to pry is just too great. Next time you are temped to ask if you can go through a stack of records that reads perfectly clearly "PLEASE DO NOT LOOK THROUGH"...don't. Back away from the hypnotizing mystery pile and place your attention on the racks filled with records where you and everyone else are intended to buy them from. For the stores I've worked in stores this is true, but I also know stores where there are piles of gems hidden from view. Ridiculous stacks of stuff. Sometimes it's just due to lack of space, time and coordination, others it's full on hoarding for the future. Don't kill the dream, Tracy, the stores do that themselves when they check Popsike and slap the highest price they see on any record you want regardless of condition. It's true, you have, but I'm serious. There's a store here that for the past year or so has been putting out high quality backlogged stuff that has sat for a couple years to decades. Another store on the island hasn't put out any of the used records that have come in since it opened over a decade ago and yet another out east that has also been stockpiling rarities for the time when people more fully give up on purchasing new music. Don't get me started on the hours of digging through unpriced boxes and crates in Switzerland. Making Brownies with Public Image LMT.